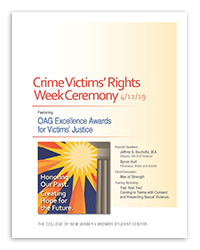 Click here to submit a nomination for the Office of Attorney General Excellence Awards for Victims’ Justice. A description of each “Excellence Award for Victims’ Justice” can be found here. Due date for nomination submissions is March 22nd. Each year, Congress declares one week in April as Crime Victims’ Rights Week to honor and recognize crime victims and those who assist them. This year, the Department of Justice, Office for Victims of Crime declared April 7th – 13th as the National Crime Victims’ Rights Week. The 2019 National Theme is: “Honoring Our Past. Creating Hope for the Future.” This year’s theme celebrates the progress made by those before us as we look to a future of crime victim services that is even more inclusive, accessible, and trauma-informed. 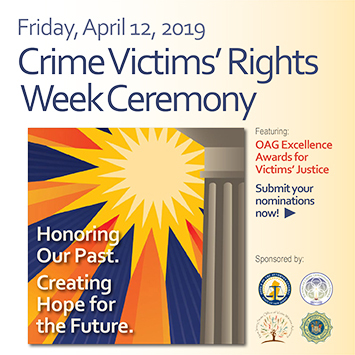 The State Office of Victim Witness Advocacy and the Victims of Crime Compensation Office is honored to host New Jersey’s Crime Victims’ Rights Week event on Friday, April 12, 2019 from 9:30am to 3:00pm at The College of New Jersey's Brower Student Center, in Event Room 100 East. We hope you will join us in paying respect to all of our victims of crime, thanking the many individuals who support them through vital services, and highlighting the role law enforcement plays in securing them justice.